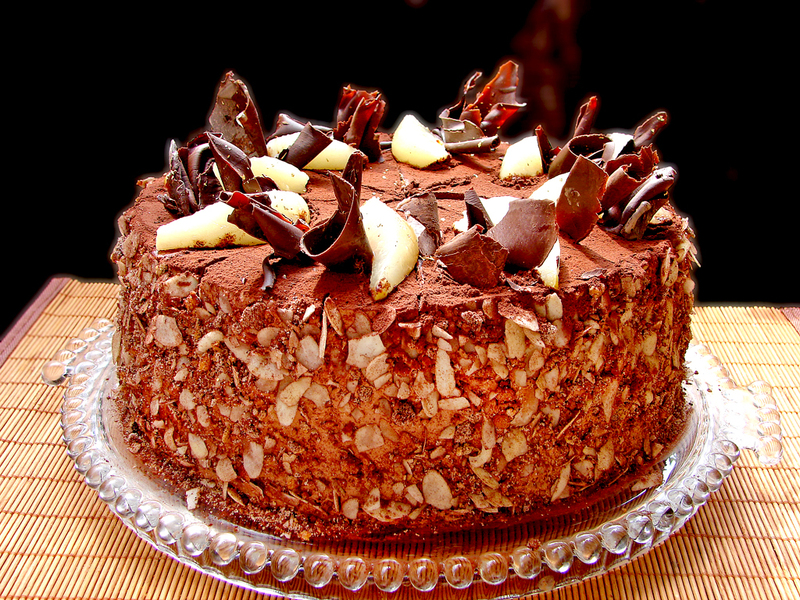 Chocolate cake with pears, necessary products and preparation. 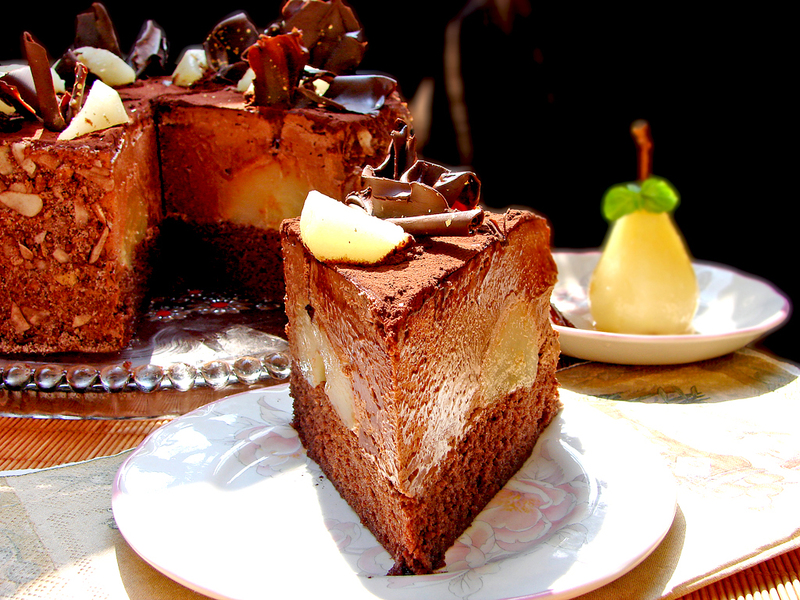 Chocolate cake with pears necessary products and preparation. To make the swamps, first whisk the yolks with half the sugar into the thick cream. Separate the proteins in snow separately. At the end of the break, add the remaining sugar to a thin stream and continue to crush until you get solid tips. Together, sift the flour, pudding, cocoa, baking powder and vanilla. To the broken egg yolks, add the proteins and the dried dry mixture by alternating them. Stir gently with a blade. Finally, pour the hot liquid oil and stir again. Pour the dough into a 26 cc tortelline and treat it with baking paper. Bake marsh in preheated 180 * oven for about 15 – 20 minutes. After baking, let the swamps cool down before proceeding with the cake. For chocolate cream, whisk the yolks with sugar and vanilla into a thick cream. Add the fresh milk and 100 ml of the cream. On very low heat in a non-stick coating, boil the cream until it begins to thicken, stick to the spoon, and leave thick traces. You can also do this on a water bath if you are afraid that the cream can burn. While the cream is still hot add chocolate to it, broken into pieces and mix until it melts completely. Cool well. Finally, whisk the rest of the cream into not too hard snow and carefully add it to the chocolate cream. It is good to make the pears cut one day in advance. For this purpose, peel them and boil for 5-10 minutes with all the other products. I do not explicitly specify the cooking time, as this depends on the pear variety. If they soften faster, cook them less and vice versa. Make sure the fruit is soft by carefully piercing it with the knife tip. Leave the pears in the syrup for at least a few hours to flavor well. In a flat toaster, place the swamps and well syrup with the cold precious juice of the pears. Cut the pears into halves and arrange them over the swamps. Tighten it with a removable ring for a cake or with the ring of the torted shape itself, in which you have it baked. You can put on the inner side with strip of acetate paper or floral cellophane for greater convenience. This will give you a smooth and level surface after removing it. 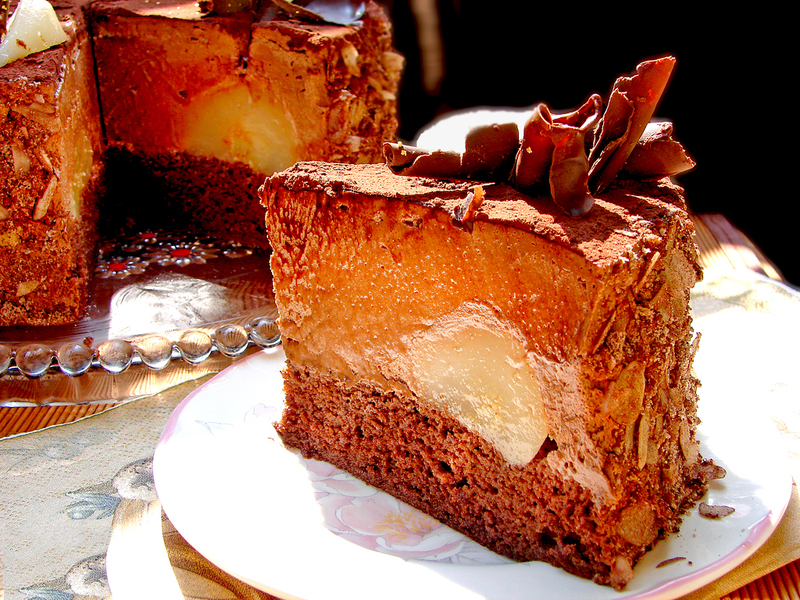 Pour the chocolate cream on the pears, smooth and put the cake in the refrigerator overnight to tighten well. Then carefully remove the ring and garnish to your taste. Cut the cake with a hot dry knife.